Dispelling the myths about minor-league baseball park Ewing Field. 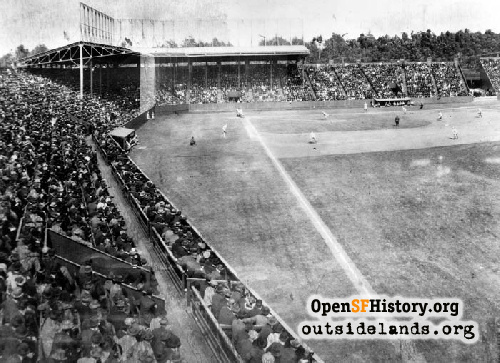 One hundred years ago, on May 16, 1914, Ewing Field opened as the baseball home for the San Francisco Seals. 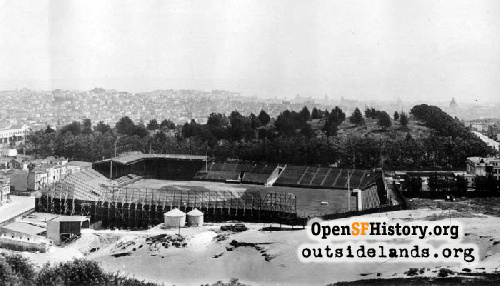 Located at Masonic Avenue and Anza Street, it hosted professional baseball for only five months before the team returned to the Mission District, yet the myths from that abbreviated season endure. Two of the most fantastic fables are Pete Daly setting a fire in the outfield, and Elmer Zacher becoming so disoriented in the fog that the bat boy had to be sent to retrieve him. In 1914 there was no player in the Pacific Coast League (PCL) named Pete Daly. In fact, in 1914 there was no player named Pete Daly playing in any of the minor or major leagues. According to baseball-reference.com, in the history of organized baseball only one player named Pete Daly ever played professionally, and his career ran from 1884 to 1907. However, there was a player named Pete DalEy who had played in the PCL: Thomas Francis (Pete) Daley. Pete Daley played in the PCL from 1909 to 1912 and from 1916 to 1918. In 1914, though, Mr. Daley was in the American League, which did not play at Ewing Field. This story originated in the Los Angeles Times of April 11, 1937. According to the Times, Daley set the fire to protest playing under conditions that he objected to. This legend next appeared in the San Francisco Chronicle of June 18, 1938, but this time Daley’s motivation was to keep warm on a cold day. 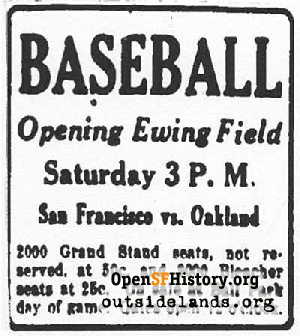 If Mr. Daley—or anyone—ever set a fire in Ewing Field, it was never reported in the game accounts of the San Francisco or Oakland newspapers. Elmer Zacher did play in the PCL in 1914, but, as with Mr. Daley, there were no contemporary newspaper reports, or even subsequent newspaper reports, of Mr. Zacher (or anyone) needing rescue during a foggy game. The earliest mention of this tall tale comes from the same Chronicle story that repeats the Pete Daley incident. Nor was a game ever called because of fog on June 6, 1914. This concoction is of more recent origin, arising from the December 1982 issue of the Haight-Ashbury newspaper. No reference is given, but it has subsequently been repeated in books and on the Internet. 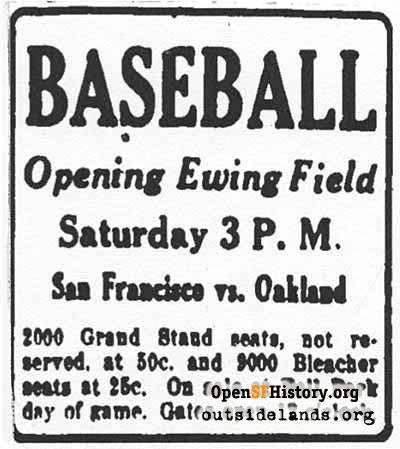 It has been implied that a dome of fog, wind, and cold settled over Ewing Field on opening day and never moved, making every game a survival epic for fewer and fewer fans till the players were performing before an empty house. Yes, there was some positively beastly weather at Ewing Field. But there was also beautiful weather. Both extremes, The Beauty and The Beast, were reported in the papers, but selective recall emphasized The Beast and ignored The Beauty, creating better legends. The Richmond District’s abysmal summer weather was no secret or recent phenomenon. 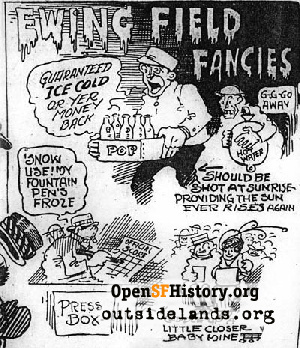 Despite the accusations that J. Cal Ewing, owner of the San Francisco Seals, was unaware of the area’s climatic conditions, he was acutely aware. He originally planned to build Ewing Field with the latest steel and concrete materials, but chose wood because it would not conduct the cold as readily. He also oriented the field with home plate at the northeast corner of the parcel, allowing the sun to warm the spectators. In 1914 the city’s official weather station was downtown, so no temperatures were ever reported for Ewing Field. 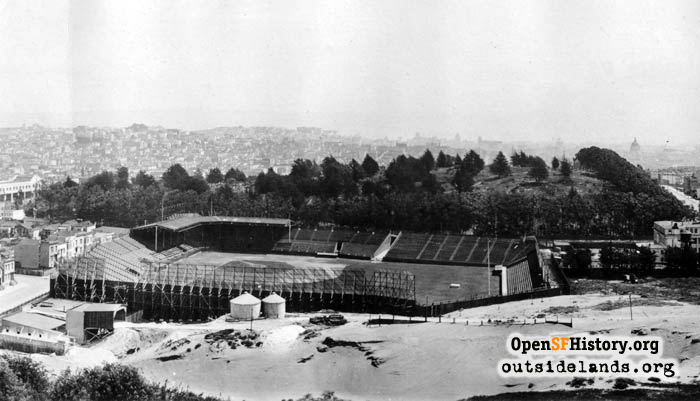 Supposedly, Ewing built the eponymous field to gratify his ego and/or to avoid sharing Recreation Park in the Mission District with the Oakland Oaks. In reality, the field was built because Ewing lost the lease to Recreation Park in a tale of betrayal and deception worthy of a Shakespeare tragedy. Faced with the loss of the Seals’ home and with time running out, Ewing had to find a parcel of land large enough for a modern ballpark. After an exhaustive search, the foot of Lone Mountain was the only site available. On Opening Day, 18,000 spectators filled Ewing Field, Lone Mountain was thick with freeloaders, and two men circled above in a tiny airplane to photograph the event. Among the crowd were two young boys, best friends from nearby Grove Street, who didn’t have the 25-cent admission. Undeterred, eight-year old Scotty and nine-year old Pat burrowed under the center field fence. Prescott “Scotty” Sullivan would become a venerable sports writer, and Edmund G. “Pat” Brown would become governor of California. It was especially windy all over San Francisco, but the big news was the wind at Ewing Field, where a large floral sculpture in the shape of a good luck horseshoe was blown over. Once the sun passed behind Lone Mountain, the temperature (an “official” downtown high of 61 degrees) dropped, and a cold wind whistled around Lone Mountain onto the field and spectators, inspiring someone to suggest that “Icicle Field” might be a better name. After the game thousands of chilled fans were forced to wait for streetcars; an ongoing source of frustration and complaint as much as the weather. The newspapers commented on the bitter weather at the next day’s game, but softened the criticism by acknowledging that it had been cold all over town (57 degrees). Nonetheless, it was a crowd that would have taxed Recreation Park’s capacity. The sports writers in the unheated press box quickly developed a survival strategy. A stadium vendor, Joe Derham, sold canned hot tamales. The writers would buy Joe’s hot cans and hold them to warm their hands. When the cans cooled, the writers would buy more hand warmers, but Joe refused to give them credit for the cold but unopened cans. The players also devised a solution to the hostile environment. A well-known liniment “with the heating power of a flock of furnaces” was liberally applied to aid the circulation. Worst off were the umpires, who were relegated to an unlighted, unventilated, and unheated room beneath the stands that was too small to accommodate two arbitrators at the same time. The Oakland Tribune proposed that a few strategically placed steam pipes for warming stoves would help. Might this have been the seed of the myth of Elmer Zacher getting lost in the fog? This is the same date that a game was supposedly called because of fog, but clearly not so. The next day, the Lone Mountain contingent set fires on the hillside to keep warm (59 degrees). Shortly afterward, it was decided that the 20-foot addition to the right field fence was insufficient, so 26 feet were added to increase the height to 50 feet. June 21 “was all that could be desired” (68 degrees). Not only did the sun force the fans to complain about the heat, it ignited fires in the grandstand. Combustible debris that had collected in the cracks of the grandstand floor spontaneously ignited. Several small fires broke out, but a glass of water was enough to extinguish each. The Examiner memorialized Friday, June 26, as “warm and comfy and the fans enjoyed themselves immensely” (79 degrees). The weekend was nicer (84 and 75 degrees), attracting thousands of fans. Located at the picturesque foot of Lone Mountain, the park is of easy access to people of all sections of the city. Direct car lines of the Municipal and United Railroads lead to the park, and our patrons are assured of much improved streetcar service. It will require only a matter of fifteen minutes to reach the park from Third and Market Streets and an additional five minutes’ ride from the ferry. Ewing Field was out in the boondocks of San Francisco. With the dead in the cemeteries outnumbering the living, moving large numbers of people was not a transit priority “out there.” There were no north-south lines serving the field and only one viable east-west route served the ballpark—the Municipal Railway’s Geary line and its spur along Masonic. Five blocks to the south was the McAllister Street line and the Hayes Street line two blocks farther away. Other east-west lines from downtown ended five blocks west at Divisadero. Taking these lines necessitated either a long walk uphill to the field or a long wait for multiple transfers. Unlike the weather, which had its good days, the transportation deficiencies were constantly bad. Baseball at Ewing Field, 1914., 1914 - Courtesy of California Historical Society. The 50-foot addition to the right field fence had two outcomes. It noticeably cut the wind, thus improving the conditions for the fans; but it also severely blocked the view from Lone Mountain. Every afternoon a fog rolls in from the Golden Gate just about the beginning of the second inning. The players become dim spectators through the mist and the few scattered spectators sit in the stands in a shivering misery. Nearly every game since the new park opened has been played in a bitter cold. The season’s best weather has prevailed at Ewing Field during the past week and there has been a big increase in attendance in consequence. But the car service has been wretched. After yesterday’s game the car accommodations were totally inadequate and complaints were many. Friday and Sunday, August 14 and 16, baseball fans were the beneficiaries of good weather and good baseball. On Friday ideal weather (64 degrees) brought out one of the best weekday crowds of the season for a well-played game. On Sunday “a monster gathering” assembled in 66-degree weather to witness the Seals sweep the double header. In the necropolitan neighborhood around Ewing Field, prohibition had come six years early. There were none of the convenient watering holes that abounded near the previous Recreation Parks. The nearest oases were on Haight Street, 3/4-mile to the south without any transportation; a couple could be found along Geary to the north; a scattering on Divisadero 1/2 mile to the east; and a sprinkling on Stanyan Street, a 1/2-mile trek on the western side of Lone Mountain. And worst of all, J. Cal Ewing made a terrible miscalculation when he decided not to serve any alcohol at the field. For the mostly male fans, the unavailability of the national beverage before, during, and after the national pastime was as much a disincentive to trek all the way out to Lone Mountain as were the lack of streetcar service and the uncertain weather. On September 6, Ewing Field became home to a third team. All season long, the Sacramento Wolves were beset with financial problems that finally resulted in the team’s collapse at the end of August. To preserve the integrity of the league, the PCL took control of the fifthplace Wolves and moved them to Ewing Field where they were renamed the Missions. The Beauty was in her full glory now. On September 9 the third largest crowd of the season sat coatless for the entire game in 82-degree heat. The next day was the hottest day of the year — 92 degrees — and once again it was coats off for another large crowd. The September 15 game between the Missions and Seals was the debut game for the former Sacramento Wolves as the home team at Ewing Field. Somewhere, the official temperature was 60 degrees. The Call and Post observed: “During the late innings the fog was so thick that the outfielders were lost to view.” The umpires briefly halted the game but did not cancel it. The Chronicle declared the game to be the foggiest ever played at Ewing Field, noting that it wasn’t a cold fog “but it made up in denseness what it otherwise lacked.” Several hits were made because the outfielders couldn’t see the ball. The Beauty dropped in for an extended visit beginning the next day bearing 67-degree weather. This was the average temperature for the next two weeks, including October 4’s 74 degrees that brought out 12,000 fans for a Seals-Oaks game. The Examiner reported warm (64 degrees) and pleasant conditions at the start of the Seals- Mission game on October 7. Then it started to rain and the Mission players expressed their displeasure with the umpire’s decision to continue play by deliberately annoying him with loud noises from their bench. The umpire repeatedly ordered them to stop, but they persisted. By the third inning he had had enough and ejected all the non-playing Missions. Which was exactly what they wanted. As the ten players happily made for the clubhouse, they laughed in the umpire’s face. The season ended with a double header on Sunday, October 25. In the morning game Skeeter Fanning threw a no-hitter against the Portland Beavers in Oakland. In the afternoon game, played at Ewing Field in 77-degree heat, the Seals completed the sweep with a 13-1 victory. Ewing Field, after being frostbitten and icicle-hung for many long, weary months, is basking in the balmy sunshine of Indian summer right now when nobody cares what sort of weather prevails. When there were ball games, Ewing Field shivered and shook and masked its distant gardens in the ocean mists. Now when the only excitement holding forth is the undisturbed growing of the grass, Ewing Field is as warm as a piece of toast hot off the gas. And the magnates, who swore at the fog and wind of the good old summer time, now railing at the perversity of fate, swear more heartily at the delicious sunshine of the fall. It is a funny old world, isn’t it? Although the PCL season was over, baseball had not abandoned Ewing Field. On November 3, the national pastime returned to Ewing Field in the form of barnstorming major leaguers. 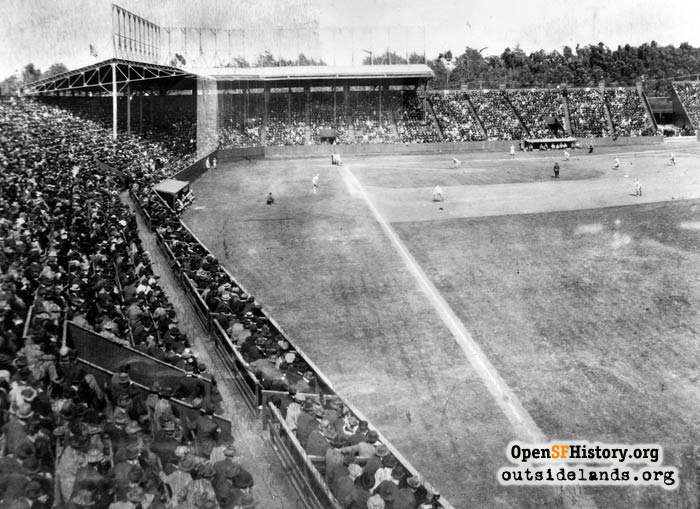 The first game was played before 8,000 fans in 74-degree weather. For their entire stay the major leaguers enjoyed San Francisco’s best weather (an average high of 73 degrees), but they were disappointed to not experience The Beast that they had heard so much about. The blinding fog was also sound-muffling. Unable to see or hear, Giants outfielder George Burns had no idea that a ball had been hit his way until it smacked him on his foot. The Cardinals’ Cozy Dolan waved a white handkerchief from his center field position to remind his teammates where he was. The American Leaguers found it too terrifying to stand at bat against Grover Cleveland Alexander, not knowing if he could see them, and not seeing his fastballs until the final instant. The last out was made, the National Leaguers left the field victors, and 1914 was history. The Seals would leave Ewing Field, but the park's history would continue for two more decades. Read about Ewing Field's post-Seals history. Page launched 23 November 2014.